Hello everyone! 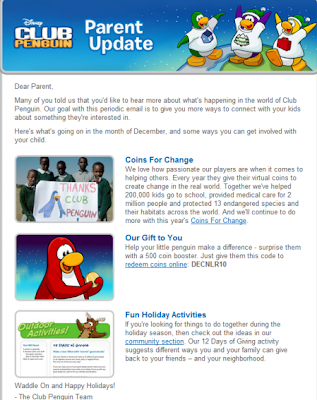 I've checked my email and I got this awesome message from Club Penguin! Dear Parent, many of you told us that you'd like to hear more about whats happening in the world of Club Penguin. Our goal with this periodic email is to give you more ways to connect with your kids about something they're interested in. Click below to check out these things!